The sibling rivalry has been white hot around our home lately. The ferocity of emotion that my eight-year-old identical girls direct at each other astonishes me at times. Every breath they take is a competition for oxygen. Every uttered word is a target for controversy. They bicker about anything and everything. They've argued about which side of the minivan to enter, and who should shut the door after they exit. This morning they woke up arguing about who would turn off the alarm clock. The argument continued at the breakfast table, with a debate over who received more face time with the cereal box, reading the nutritional breakdown and ingredient list. Then they jockeyed for position at the bus stop to see who could board the bus first. During the school year, they get a break from each other during the day, where they are placed in separate classes. 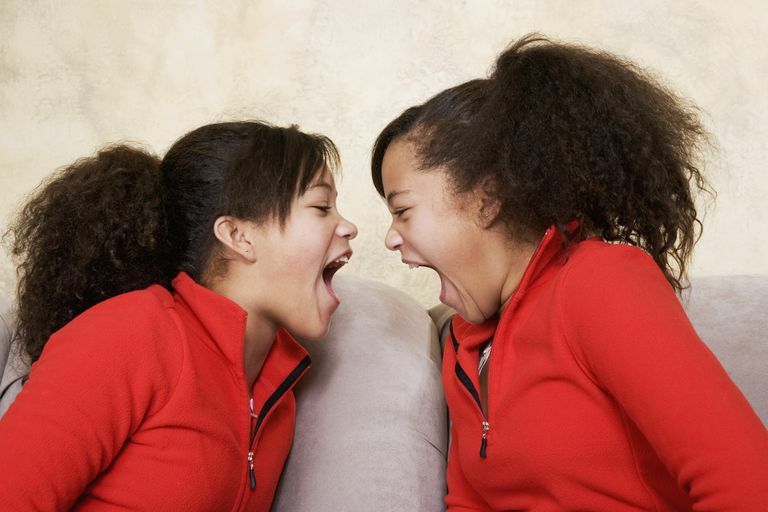 But the rivalry resumes the moment they return home, in constant competition to get the best snack as they try to outtalk each other in describing their adventures at school. It's maddening to be their mother sometimes. I simply don't understand why they're always at odds. From my vantage point, they're both happy, well-adjusted girls with everything a child could want from life, if not more. I can't comprehend why they're so resentful of each other. Why can't they be happy with what they have, instead of worried that their sister might get something better? I know that it's a phase. It won't always be like this. Like so many other aspects of parenting multiples, this too shall pass. Their rivalry escalates from time to time, and soon enough we'll pass into a blissful period during which they're best buddies (more like partners in crime!). So many of my friends who have sisters say "They may fight now, but they'll treasure each other when they're grown." But we can't wait until they're grown and gone to have peace in the house. So, we've tried to generate some harmony, using simple tactics to remind the girls about how special they are, how much they have to be grateful for, and how lucky they are to have each other. After weeks of frustration over their competitiveness, I decided it was time for some extreme measures. I was determined to teach them to focus on the positive aspects of their life and to stop expending energy on trying to beat their sister. Here are some of the strategies that we employed. We've added some new elements to our bedtime routine. Every night, after reading with each girl individually, we spend some private one-on-one sharing time. It's a special time to talk about their day and discuss any concerns or prayer requests. Now, after the talk and prayer, I ask them each two questions designed to help them appreciate themselves, and each other. I start with, "Tell me something you like about yourself or your life, or something that you're thankful for today." I'm hoping to get them to focus on how fortunate they are. When you're feeling good about yourself and your heart is full of gratitude, it's not quite as easy to feel resentful towards your fellow man -- or, in this case, your fellow sister. And then I follow it with, "Tell me something you like about your sister, or why you're thankful for her." It's really gotten them thinking about each other in a positive light. In the beginning, we got pat answers like "She's nice" or "She's a good sister." But as the days go by and they're forced to come up with new responses, the comments get more specific. "It was nice when she brought me a glass of water when I wasn't feeling well." "She is really good at doing math, and I was glad when she helped me with my homework." We work really hard to provide opportunities for the girls to explore individual interests. Although they do share some activities together (Brownies, singing in the children's choir at church, swim team), we strongly encourage them to develop distinct interests. One daughter takes art lessons and plays on a basketball team. The other takes karate and performs with an Irish dancing group. It means that we spend most afternoons and a good chunk of weekends shuttling them around town, but the payoff is worth it! How my heart soared when I watched my daughter sit on the sidelines cheering her sister's basketball team onto victory. And I knew we were doing the right thing when the other daughter glowed with sisterly pride at her twin's dance recital. These activities give them an opportunity to express their individuality and to be recognized for their own abilities. It is remarkably more peaceful in our household when the girls are feeling a sense of accomplishment about their individual activities. They're much more likely to offer each other support and compliments, rather than resentment and debate. Finally, I try to remind them every day how much they're loved and how fortunate they are. In every situation, I remind them that sisters come before friends, and feelings come before things. I encourage them to think about how their behavior will impact their sister, and reward them emphatically when I catch them being considerate or courteous to each other. The other day I explained to them just how rare and special it is to be a twin. I told them, "So many people would give anything to have a twin, a special sister in their life. Ask your friends; see how many of them wish they could be a twin!" "But people can't just make that happen," I explained. "Even Bill Gates, the richest man in the world, can't buy himself a twin. Even someone with power, like a king or the President of the United States, can't give himself a twin brother." "God has given you this incredible gift. He made you identical twins and gave you a special sister. If someone gave you a treasure, would you beat it up and talk ugly to it? No, you would be proud and thankful to have it. You'd take good care of it and treat it with respect. And that's how you should treat your sister."